← Could inequality have caused the financial crisis? Welfare reform was a battle fought over the wisdom of using federal dollars to supplement the incomes of low-income mothers and their children. Yet, even as Congress in the 1990s worked to cut cash assistance in the Aid to Dependent Families with Children program, they were expanding the Earned Income Tax Credit, a refundable tax credit often worth thousands of dollars per year for low-income working families with children. The largest expansion in 1993 more than doubled the maximum tax credit that families with more than two children could claim from just over $1,500 to just under $4,000 per year. These expansions were costly. The figure below from the Tax Policy Center shows that real spending on the EITC increased sixfold from 1989 to 2009, even as AFDC spending barely budged. Variation in EITC spending over time provides one of the best natural experiments to investigate the impact of increased income to disadvantaged families on a range of social and economic indicators. 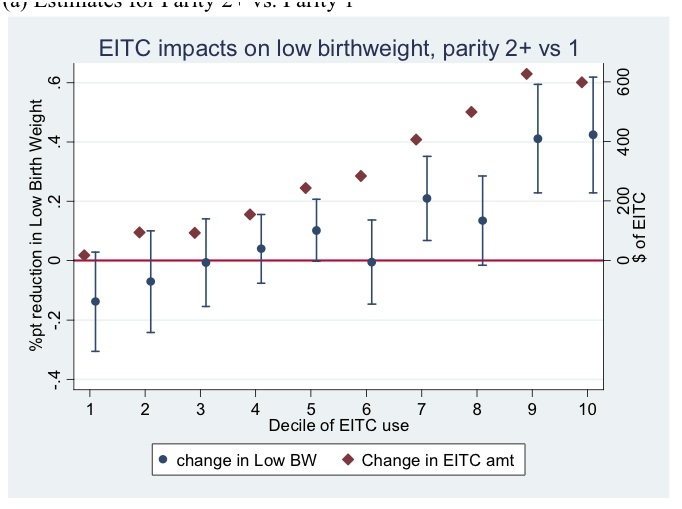 A recent working paper by Hilary Hoynes, Douglas Miller, and David Simon meticulously investigates whether the EITC impacted the incidence of low birthweight (LBW) among the targeted population. As always, I would encourage interested readers to consult the NBER working paper. This is a huge effect. The figure below plots out the distribution of effect sizes by decile of predicted treatment effect – an estimate that given a mother’s education, state of residence, age, and race that she would be a recipient of the EITC. As one might predict, most of the positive program effects accrue to women in deciles 7-10, those women who would be predicted to be the largest beneficiaries. They imply that a substantively large, and clinically important reduction in infant LBW risk can be achieved through one thousand dollars of income transfers. To my mind, there are three other aspects of this paper that make it unusually rich and compelling. First, the authors can address the common worry to a diff-in-diff study design that the trend observed in the treatment group was caused by factors at play before the study intervention. Using an event study design, they compare trends in LBW between the first and second plus time mothers in the several years before the 1993 expansion of the EITC, and verify that the timing of the policy corresponds to the diverging trends. Second, the authors broaden their analysis to include several other complementary outcomes related to infant health – changes in birthweight above and below the typical 2500 grams cutpoint, Apgar scores (a composite measure of infant reflexes and basic functioning), and incidence of pre-term weight. This should lessen the worry that they have “cherry-picked” a single outcome that is most congenial to their analysis. Third, the authors consider some potential mechanisms through which an exogenous increase in income might impact infant health. Economic theory would dictate that if child health is “income normal”, that is if parents invest more in their children’s health when they have more income, than child health should increase from these investments. The main place where this shows up is in greater receipt of prenatal care (although, interestingly, not increased insurance coverage). They also find that the “treatment group” was more likely to reduce their smoking and drinking rates during pregnancy, a possible consequence of being in closer relationships with medical providers or plausibly, a reduction in maternal stress due to higher income. To summarize, this study suggests that the EITC may be a remarkably good investment, especially once the total range of health impacts are considered. By any conventional cost effectiveness threshold, it is hugely cost effective to spend $1,000 to reduce the risk of LBW among disadvantaged children. An important place for this research to go in the future is to push further on mechanisms. Maternal mental health and stress, greater money to pay for care and for trips to see providers, and higher incentives to increase workforce participation are some of the possible factors that may come into play. Knowing which of these factors are shifted by greater income could allow better targeting to populations, and the integration of complementary interventions with the EITC. This entry was posted in Blog posts and tagged cash assistance, children, evaluation, health, measurement. Bookmark the permalink. This info helped me a lot on a project I’m doing for school. Thank you!